Subject: Instructions for the purchase of laptops/notebooks and similar devices for eligible officers — revised guidelines. In supersession to this Ministry's Office Memorandum bearing No. 08(64)/2017-E.II(A) dated 27th September 2016, regarding purchase of Note Book/Lap-Top computers by Ministries/ Departments & delegation of powers thereof, it has been decided that lap-top; tablet; notepad; ultra-book; notebook, net-book or devices of similar categories may be issued to officers of the rank of Deputy Secretary and above for discharge of official work. These powers shall continue to be exercised in consultation with the Financial Adviser by the Secretary of the Ministry/ Department or any other authority who are specifically delegated these powers by this Ministry from time to time, duly taking into consideration the functional requirements and budgetary provisions. (i) Cost of device: The Cost of device including Standard software* shall not exceed Rs. 80,000/-. 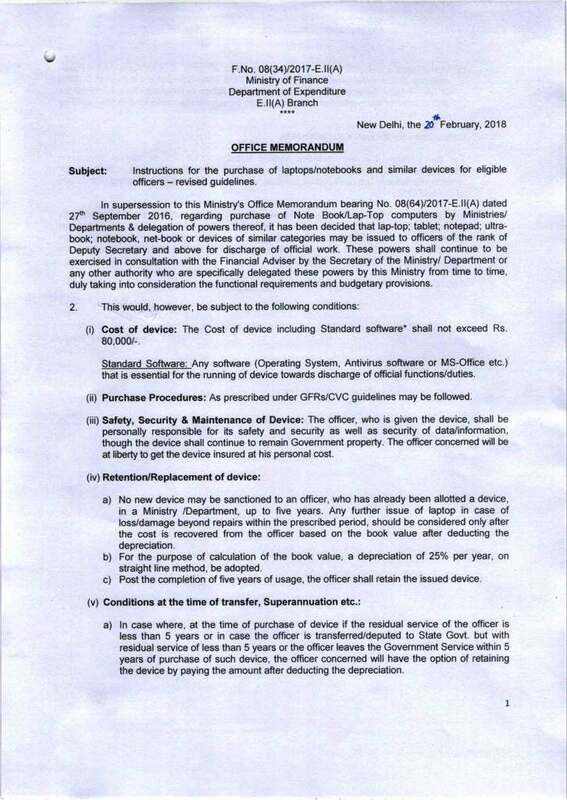 a) No new device may be sanctioned to an officer, who has already been allotted a device. in a Ministry /Department, up to five years. Any further issue of laptop in case of loss/damage beyond repairs within the prescribed period, should be considered only after the cost is recovered from the officer based on the book value after deducting the depreciation. 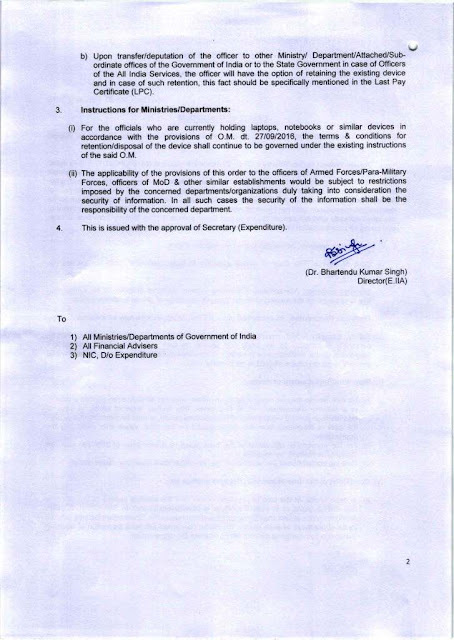 b) Upon transfer/deputation of the officer to other Ministry/ Department/Attached/Sub-ordinate offices of the Government of India or to the State Government in case of Officers of the All India Services, the officer will have the option of retaining the existing device and in case of such retention, this fact should be specifically mentioned in the Last Pay Certificate (LPC). 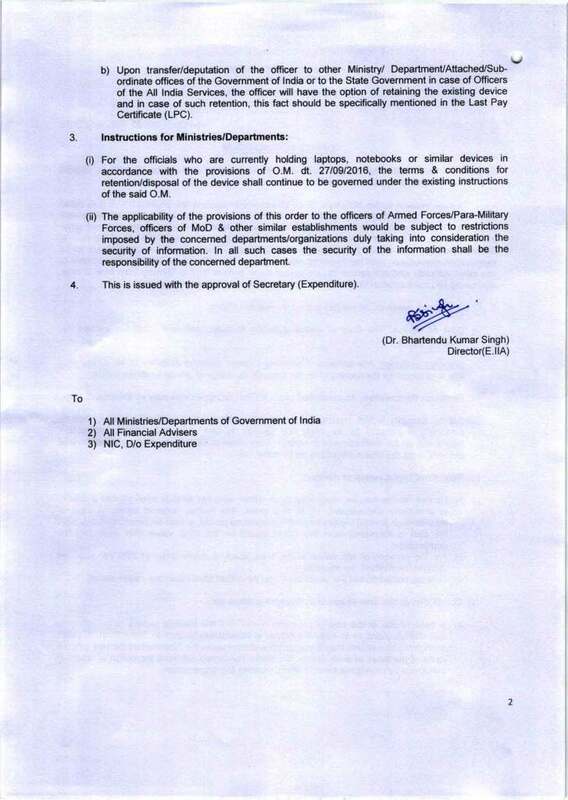 (ii) The applicability of the provisions of this order to the officers of Armed Forces/Para-Military Forces, officers of MoD & other similar establishments would be subject to restrictions imposed by the concerned departments/organizations duly taking into consideration the security of information. In all such cases the security of the information shall be the responsibility of the concerned department.